The DRA-ACT-2I AND DRA-ACT-2V Series are isolated 2-wire loop-powered ac current and ac voltage input DIN rail mount signal conditioners that convert the measured input into a proportional, linear and highly accurate 4-20 mA output current. 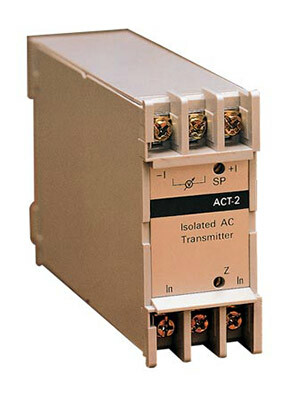 The DRA-ACT-2I Series of ac current input models includes models for 0 to1 Aac and 0 to5 Aac inputs with 4 to20 mA output. The DRA-ACT-2V Series of ac voltage input models includes models for 0 to150 Vac, 0 to250 Vac and 0 to400 Vac inputs again with 4 to 20 mA output. For complete safety, an internal transformer isolates the signal conditioner input from the output thus enabling these units to withstand large momentary inputs. Complete input to output isolation, high surge current capacity and high output signal-to-noise ratio make these signal conditioners highly immune to ground loop signals and RFI. These transmitters are also equipped with a “test” terminal which facilitates monitoring of the output current by measuring the voltage drop across an internal 10 Ohm resistor without disturbing the 4 to 20 mA process loop.